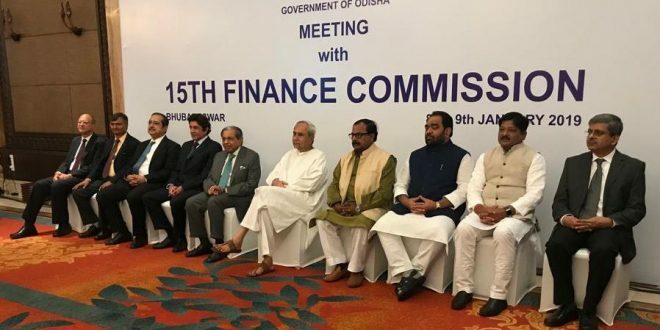 Bhubaneswar : The Odisha government has presented a requirement of Rs.8,24,644 Crore during next five years of 2020-25 to the Fifteen Finance Commission (FFC). It has projected the requirement of Rs.6,71,365 Crore to meet Pre-Devolution Revenue Deficit, on State Specific Need it require Rs.87,520 Crore, for Disaster Response Rs.11,875 Crore and Grants To Urban and Rural Local Bodies project of requirement is Rs.53,884 Crore. Odisha CM Naveen Patnaik has presented the Projection of Requirement to FFC. For funding the developmental needs of the Urban and Rural Local Bodies it has been urged that FFC should increase the level of transfer to PRI and ULBs from existing level of 3.05 Percent to at least 5 Percent of the Divisible Pool in order to meet the infrastructure deficit and also improve the quality of Public Services in both Rural and Urban Areas across the Country. Odisha Government has said that this enhancement of funding share will improve their capacity to raise resources. On Requirement of Rural Local Bodies Rs.33,574 Crore has been projected, while for Urban Local Bodies Requirement is Rs.20, 310 Crore, so total is Rs.53,884 Crore for both the Sectors. State Disaster Response Fund (SDRF) size is needed to be Rs.11,875 Crore and it may be borne by Union Government entirely. However for Disaster Mitigation an amount of Rs.25752 Crore may be provided to the State during 2020-25, said sources. On State Specific Requirement highest amount of Rs.25,000 Crore has been asked for Piped Water Supply To All in the State. This is an ambitious program, the State Government plans to provide Piped Water Facility for the entire population. Odisha being a flood prone State, it has been asked for an amount of Rs.11,816 Crore for Flood Management in Rivers and specifically for Master Plan for Mahanadi Basin under State Specific Requirement. For building up Cyclone and Flood Resilient Electrical Distribution System an amount of Rs.7736 Crore has been asked by the State Government. Rural Connectivity is a major issue in Odisha and the State Government has urged FFC to allocate Rs.5175 Crore for connecting the unconnected, officials say. While PMGSY Roads of 46,972 Kilometers have been constructed in the State, funds are not available for maintenance of Five Year Completed PMGSY Roads. So the State Government has urged FFC to allocate Rs.5851 Crore for such roads laid in Rural Areas of the state. For Up-Gradation of Ashram Schools to High Schools, the State Government has asked Rs.2450 Crore. For Up-Gradation of High Schools to Higher Secondary Schools, the state Government has asked for allocation of Rs.2000 Crore. With elephants moving out of the forests and are killed due to electrocution, the State Government has urged FFC to allocate Rs.1905 Crore for Infrastructure required in Elephant Corridor. For other various types of State Specific Requirement , the State Government has asked for Rs.21,687 Crore. So the State Government is asking for Rs.87,520 Crore for State Specific Requirement, said an official.